Scuba diving in La Jolla is available daily. Our dive guides lead scuba groups throughout the San Diego underwater marine park. Don’t miss the opportunity to experience diving at the La Jolla Cove or the La Jolla shores canyon wall dives. Daily our guides in La Jolla to lead excursions scuba diving in the ecological reserve. San Diego is home to an amazing variety of interesting life. Many consider this protected marine area to be one of the premier west coast dive locations. The ocean park stretches over six thousand acres. Boasting the breathtaking Cove and Shores sites. Scuba participants can experience a variety of submarine landscapes. Lush kelp forests, shallow rocky reefs, and deep canyons. 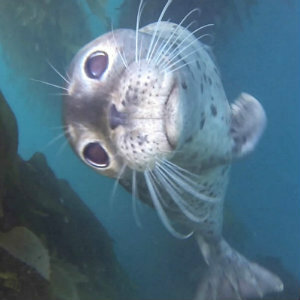 Our first scuba dive at the Cove is in the giant kelp followed by a second dive along the sea cliffs near the sea lions. San Diego is a world renowned scuba destination. During our La Jolla Cove adventures, you will encounter an abundant array of life. The protected reserve is quite entertaining even before entering the water. 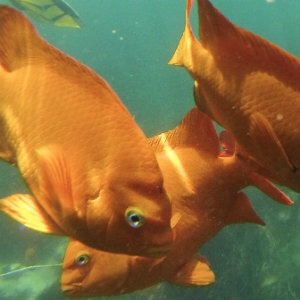 The marine park boasts two separate and very distinct diving experiences. First is in the magnificent giant kelp. This area is a stunning fantasy land teaming with life. Famous for the beautiful visual imagery from below the Pacific. This trip is a must for all underwater photography enthusiasts. Diving along the majestic cliffs lining the shore is usually next. This section is a bit shallower. Bright orange Garibaldi damselfish are often swimming along the cliff walls. Entry from a small beach below stunning cliffs. Kelp forests teaming with fish. Rocky reef filled with lobster, crab, and abalone. Seals make the area home. Various species of sharks throughout the spring and summer. Other species including bat rays, eels, and giant black bass. Ask about our La Jolla canyon dives. Daily our scuba guides lead groups along both the North and South sheer underwater walls. San Diego offers a great opportunity to wall dive in a cold water environment. The shores site is often a local diver’s first experience. Slow sloping sandy bottom. This site’s shallower regions are ideal for scuba certification classes. Refresher training is also an option at the shores. The sandy floor drops straight into the dark abyss. Participants can find out a variety of critters. Explore the crevices that cover the top section of this sheer wall. The south end of Kellogg Park is the meeting point. Shore entry for scuba groups from a large flat beach. Vast sand shallows sloping to a rocky drop-off. Steep canyon walls are home to many creatures. Look for many octopus, crab, and spiny lobster. Unique site visitors may include dolphins and baby whales. Be on the look out for the elusive angel shark. What should I expect diving San Diego? Participants must be at least Open Water certified scuba divers. Groups meet by 7:00 am at the dive sites. Two tank scuba tours usually finish up by noon. Our staff will bring all needed rental gear to the dive site in La Jolla. All of our guides are professional divers. Optional daily snorkeling adventures available. Call for advanced to arrange all scuba trips. Scuba activities are available on most days throughout the year in Southern California. With cooling water temperatures, the winter months bring some of the best visibility. The winter also brings the gray whale migration. Often pods of whales pass near San Diego on their way to warmer climates. Spring months bring new life to the reserve. 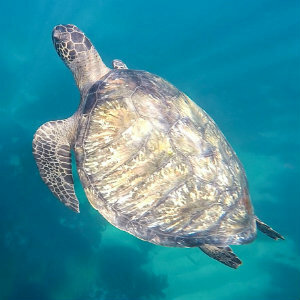 Our snorkeling experiences are a fantastic option in the spring months. During March and April, lots of species give birth. Scuba in La Jolla with a variety of newborn species is a special experience. California starts to warm up in the summer months. With warmer temperatures also come tuna fish, sunfish, jellyfish and leopard sharks. Some of the most pleasant diving in La Jolla is during the autumn. The Pacific is still quite warm and fish are abundant. There is a protected ocean sanctuary off the coast and it is awesome! Snorkeling is a fun adventure. Visitors should set aside time to explore this unique recreational area. 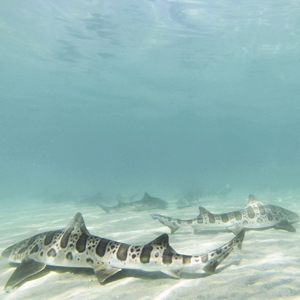 Swimming with the gorgeous leopard sharks. Exploring the enormous caves. Even if your not scuba certified there is something for everyone in the La Jolla reserve.